Graeme Shinnie, Jordan Rhodes and Kevin McDonald have been called up for Scotland's final Euro 2016 qualifiers against Poland and Gibraltar. 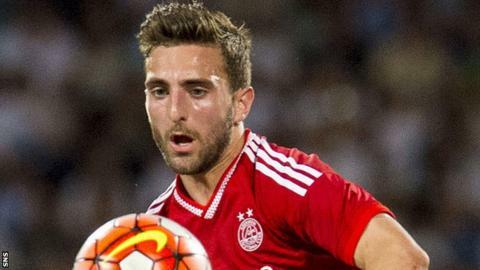 Aberdeen left-back Shinnie, 24, gets a first call-up while Blackburn striker Rhodes, 25, and uncapped Wolves player McDonald, 26, return to the squad. Celtic defender Charlie Mulgrew, 29, is in the squad despite a thigh strain. The Scots can make the play-offs if they take at least four more points and other Group D results go their way. Poland, who drew with Scotland earlier in the campaign, visit Hampden on 8 October before Gordon Strachan's side face Gibraltar in Portugal on 11 October. If the Scots get four points and Republic of Ireland lose to both Germany and Poland, Strachan's side will claim the play-off berth. Another possible scenario is the Irish qualifying automatically with current group leaders Germany and Scotland pipping Poland to third place and the play-off. For this, the Scots would need two wins and for Poland to lose to Ireland. Strachan said McDonald is "getting better and better and he deserves to be there" and, on Shinnie, commented: "He's having a successful season and he can cover other positions." "We don't know the system we'll play as yet - we're open minded so we'll see if [Jordan Rhodes] fits the style we decide to play. "We need to score - but I'll wait on deciding my system first." In September's double-header, Scotland lost to both Georgia and world champions Germany. However, they have a better head-to-head record from their two games against Martin O'Neill's Republic of Ireland and would hold the same advantage over Poland if Adam Nawalka's side lose in Glasgow. The Scotland coach is viewing the first game against the Poles as a "game we have to get something from". "You could say we've got to win it - although stranger things have happened in football," he explained. "There was disappointment [after the two recent defeats] but we're up for it again - players, staff, everyone. "We're still in there. The first game against Poland will be huge." James Morrison, 29, of West Brom, is suspended for Scotland's meeting with Poland but could feature in Portugal. Fellow midfielder McDonald has previously been in squads without being capped. On Mulgrew, Strachan said: "I spoke to Charlie and we agreed to put him in the squad and he will tell us in the next couple of days whether he can make it or can't make it. "Charlie is three players, really. He can play in three different positions and he has become a huge player for us." Celtic midfielder Stuart Armstrong, 23, was initially called up for the last double-header but both he and Ipswich Town's Christophe Berra, 30, pulled out due to injury. Armstrong remains unavailable while Berra is one of the defenders named in Strachan's latest squad. However, Derby County left-back Craig Forsyth, 26, drops out. Rhodes, with five goals from seven club appearances this season, has three international goals to his name.